For all of human history there has been a bond between people, land, and animals. The Creator God has given us to each other. In spite of the industrialization of agriculture we all feel the need for to feel part of this circle of belonging. Sheepdog demonstrations are the way Connie and John try to help people get in touch, or stay in touch, with this beautiful harmony. We try to explain what a marvel it is that sheep provide people with a wonder fabric that keeps us warm, even when wet, and breathes enough to be worn comfortably in the heat of summer. 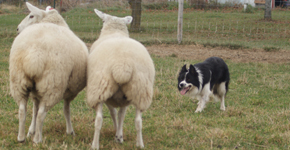 We demonstrate the miracle of the Border Collie who, with a little understanding and direction from human partners, will work its heart out moving, sorting, and penning sheep with a maximum of efficiency and a minimum of stress. We have seen thousands of people be fascinated and inspired by these demonstrations all over the western suburbs of Chicago, and into northern Illinois. This year we will make our first foray into central Illinois as we bring the dogs to work the flock at the Lincoln Log Cabin State Historic Site south of Charleston. Sunday, April 7, Naper Settlement, 523 S. Webster Street, Naperville, IL 60540, demonstrations at 1:45 and 2:45 p.m. There is an entrance fee for the Settlement, and there will be other demonstrations at this historic living museum on this day. Saturday and Sunday, May 4 and 5, Kline Creek Farm (DuPage County Forest Preserve), 1N600 County Farm Road, West Chicago, IL, 60185, four demonstrations between 10:00 a.m. and 4:00 p.m. each day. No entrance fee. The weekend will include sheep shearing, traditional spinning and weaving, and tours of the 1890s farm. Saturday, May 25, Lincoln Log Cabin State Historic Site, 402 S Lincoln Hwy, Lerna, IL 62440 (8 mi south of Charleston, IL). Details to be determined. Saturday, June 1, St. James Farm (DuPage County Forest Preserve), 2S541 Winfield Road, Warrenville, IL 60555, four demonstrations between noon and 3:00 p.m. This is part of the Farm’s annual Family Field Day which offers a host of farm related exhibits and demonstrations. Saturday, June 29, Peck Farm Park (Geneva Park District), 4038 Kaneville Road, Geneva, IL 60134, demonstrations between 11:00 a.m. and 1:00 p.m. as part of the Farm’s 150th Birthday Celebration. Saturday, July 20, we are in conversations with the Lion’s Club of Waterman, Illinois, to do demonstrations for their annual tractor show. Keep watching this page for developments.